A new retirement study conducted by Merrill Lynch and Age Wave polled the preferences of retirees aged 50 or older to determine their preferred long-term care method. The results concluded that the majority chose prefer home health care within their own home as their primary chosen method for long-term health care delivery while aging. MyHomecareBiz. Approximately 85% stated that they would prefer to receive extended care within their home, while 10% stated that assisted living facilities were their top choice. 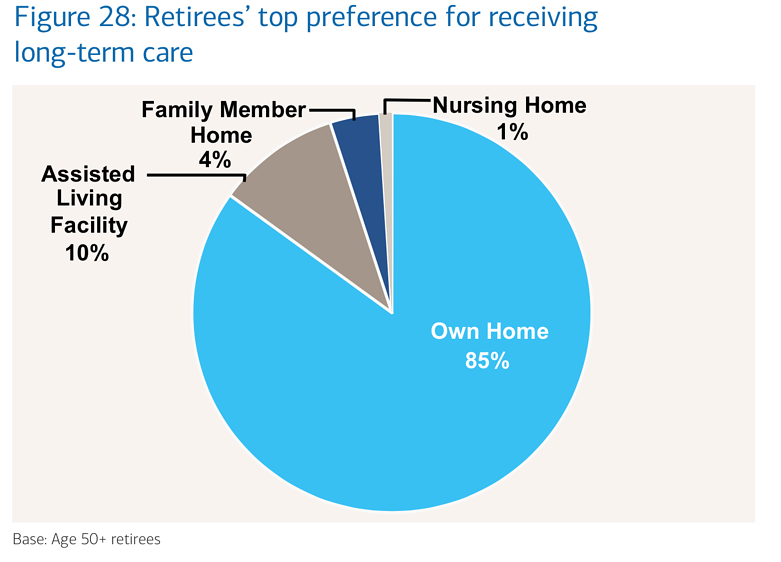 Additionally, 4% chose the home of a family member as their preferred care method and 1% had chosen nursing home care. “Overwhelmingly, retirees say their top preference for receiving extended care, if needed, is to age in place in their own home. With new technologies (such as telemedicine and remote diagnostics)-, growing numbers of home care providers and services, and renovations to make home more aging-ready, it is increasingly possible for retirees with health challenges to continue living independently at home. In fact, there has been a significant shift in where people are receiving care. The number of nursing home residents has declined in the past decade, while at the same time the number of people receiving care at home has increased. The number of nursing home residents has declined in recent years while the number of home care recipients has increased, much of this could be attributed to new technologies in creating a more “aging-friendly” home… as well as advanced options in receiving home health care. In fact, those 55 years or older account for nearly half of all spending on home renovations- many of these renovations are attributed to adding aging-friendly features such as modifying stairs and other potentially dangerous features. "Today there are more choices to enable people to remain in their homes as they age,” he said.